This spring, Triple Helix partnered with an occupational therapy doctoral student from Virginia Commonwealth University to develop assistive devices for people in the Hampton Roads region. 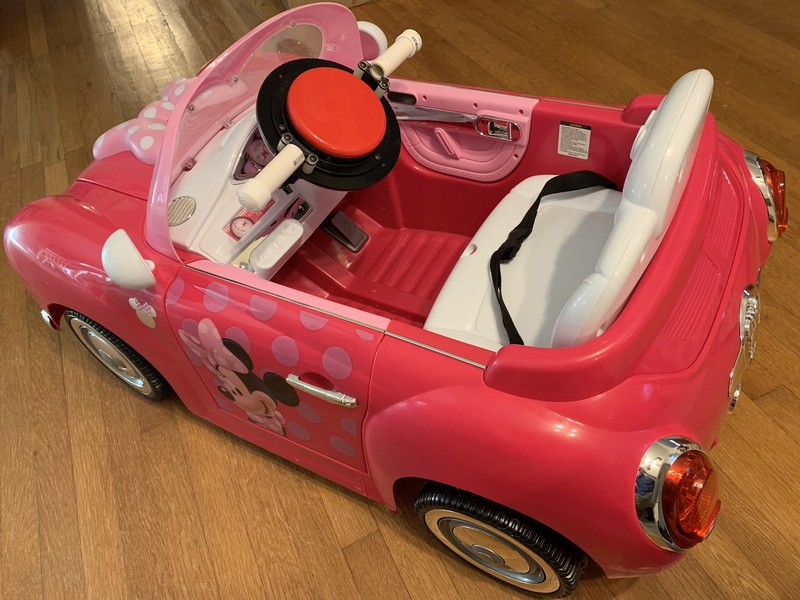 Through communication with the Children’s Assistive Technology Service (CATS) a need was identified for a modified ride-on toy car, based on the University of Delaware’s GoBabyGo project. This project aims to provide access to low-cost mobility devices for young children without other means of exploring their environment. In this case, the recipient was a young girl who does not have the ability to move her lower extremities as a result of a birth defect. To provide access to the car’s controls, a 5-inch switch was mounted on the steering column and wired via a relay switch to the car’s motor to replace the foot pedal function. Additionally, PVC handles were added on each side of the center switch for more ergonomic steering control. 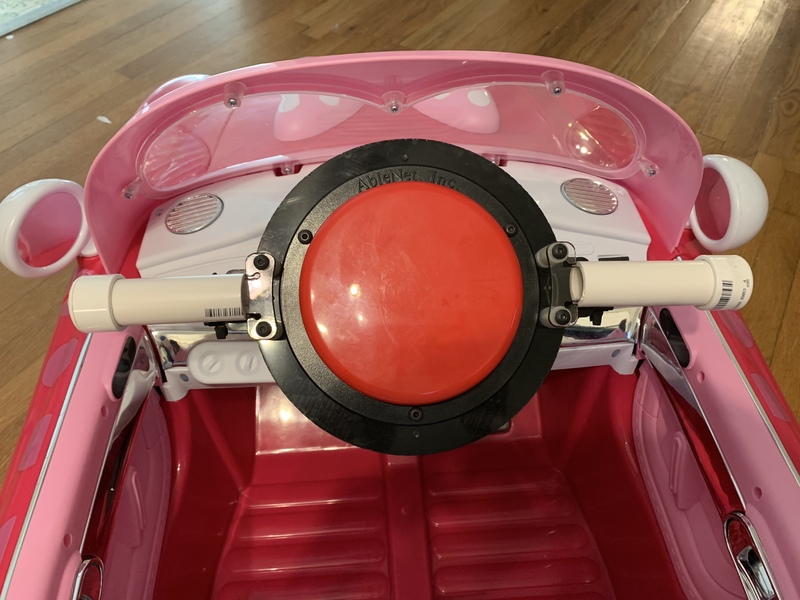 To also allow for simultaneous propulsion and steering, the handles fit over a laser-cut Lexan frame which, when flexed, activate an additional limit switch on each side of the steering column. This design concept can be applied to other ride-on cars, depending on a particular child’s needs and functional abilities. Bill of Materials for Genome Kappa, presented to the team’s Robot Inspectors at our official events in 2019. Genome Lambda is our robot for the 2019 FIRST Robotics Competition game, DESTINATION: DEEP SPACE Presented by The Boeing Company. Triple Helix is proud to publish this essay as part of our submission for the 2019 FIRST Robotics Competition Chairman’s Award. Triple Helix has been a leader of the Hampton Roads (HR) community since 2008. Since then we’ve worked tirelessly to spread the values of FIRST and to increase interest in STEM in our region. During the past five years, we’ve forged new connections between our FIRST team and the VA Peninsula at over 90 community and sponsor-hosted events, encouraging others to join the FIRST community. Rumble in the Roads, the annual off-season competition we operate with partner teams 5957 and 1610, is our largest STEM outreach event. Since 2014, we’ve attracted an average of 30 teams from VA, NC, and MD and 300 visitors, including students, parents, mentors, and government figures such as the school’s superintendent and the Vice Mayor of Newport News. This event is an opportunity for teams to practice and train new students before the start of the next build season. In 2018 we supported rookie teams 7429, 7675, and 7715, helping them prepare for the following FRC season by waiving their Rumble competition fees and partnering them with veterans who shared their experience and resources like their drive teams, pit crews, and drivetrains. In 2018, Triple Helix established the Peninsula STEM Gym, which is a shared space that provides a plethora of options for local FIRST teams to explore. Attached to a community woodworking makerspace, the STEM Gym serves as a workshop, practice field, and collaboration space for all levels of FIRST teams. 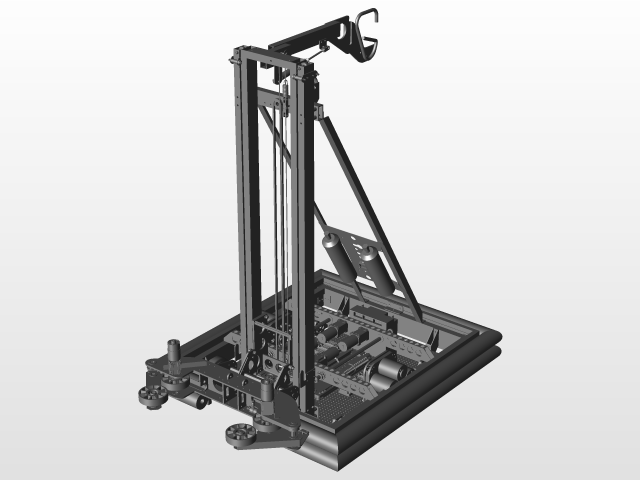 We have a full-size FRC and FTC playing field available for teams to effectively prepare for competitions. Plans are evolving to further expand the use of the space for local FIRST teams. Our sponsors are a part of our identity, and they have a huge impact on how we perform at competitions and in the community. For example, we interacted with over 1,200 visitors when we displayed our robot alongside sponsors DoD STEM and SPAWAR at the 2016 Naval Air Station Oceana Air Show in VA Beach. At NASA Langley’s invitation, we demonstrated our robot at their Exploration Days event at Busch Gardens Williamsburg for over 20,000 park visitors from around the world during each day of the event. We’ve exhibited at NASA’s Youth Day where we were a key part of the experience for NASA employees and their children. In 2016, we partnered with sponsor Jefferson Lab to host the HR FRC Kickoff; they later commissioned our team to 3D print parts for the GlueX Experiment. In 2017, manufacturing firm Continental Corp. invited us to tour their facilities and show our robot to their staff. We show our gratitude for our local sponsor, the Junior Woman’s Club of Hilton Village, by annually supporting their dinner theater event as wait staff. Club members stated “Your students did a wonderful job waiting tables for us at Dinner Theatre!” In July of 2017, NASA and Boeing invited us to the NASA Langley Centennial Gala; student leaders mingled with industry officials, made professional connections, and participated in a milestone event. Later that summer, we gave a presentation about our team’s strategies and structure to AFCEA’s HR chapter at Langley AFB. Our team regularly works with organizations, businesses, and schools to incorporate FIRST into our region. We annually participate at the CNU Community STEM Day where we demonstrate robot capabilities to 4,500 visitors. Our team has previously run the FRC Summit at CNU, where regional teams share knowledge on topics such as scouting, build season strategies, and off-season projects. We participated in the 2016, 2017, and 2018 YMCA STEM Fairs at the VA Air and Space Center, showing our robot to over 1,600 students, local dignitaries, and business leaders. We’re devoted to making a positive impact on our community through FIRST. A favorite outreach opportunity is with a chapter of Cooperating Hampton Roads Organizations for Minorities in Engineering (CHROME) at a local church; after meeting 20 curious CHROME Club elementary school students in 2015, the students asked for us to return for more robot-related antics, which we have successfully done in 2016 and 2017. We introduced our robot to the 2016 STEM for Girls summer camp hosted by the Peninsula Jaycees and to the visitors at the Lewis Ginter Botanical Garden Nature Connects: Art with LEGO event. In 2017, we exhibited at the State of the City Luncheon to local dignitaries and potential sponsors to exemplify advanced STEM programs in our school system; we were able to meet many school board members who were previously unaware of our team. We’ve made a strong connection with our student body through our participation in activity fairs and open houses where we’ve displayed our robot’s capabilities and team’s aesthetic. Through demonstrations at local elementary and middle schools, we ensure that there will be students joining our team in the future. Our team regularly quotes the phrase, “it’s not just about the robots.” This has truly been expressed in our constant zeal for spreading the values of FIRST throughout our region, in our ongoing mission to inspire others to pursue technological fields and participate in the worldwide FIRST community. 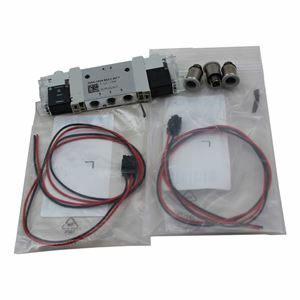 Festo gives the flow rate through their solenoid valves in terms of “standard nominal flow rate”. What does this mean? How does it compare with other valves on the market? Here’s a spreadsheet that converts the specified flow rate (which is actually a mass flow rate even though it’s in units of volume/time) into a flow coefficient or Cv. 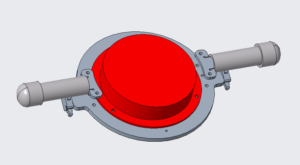 This lets you directly compare the size of the valve to other vendors’ stuff. 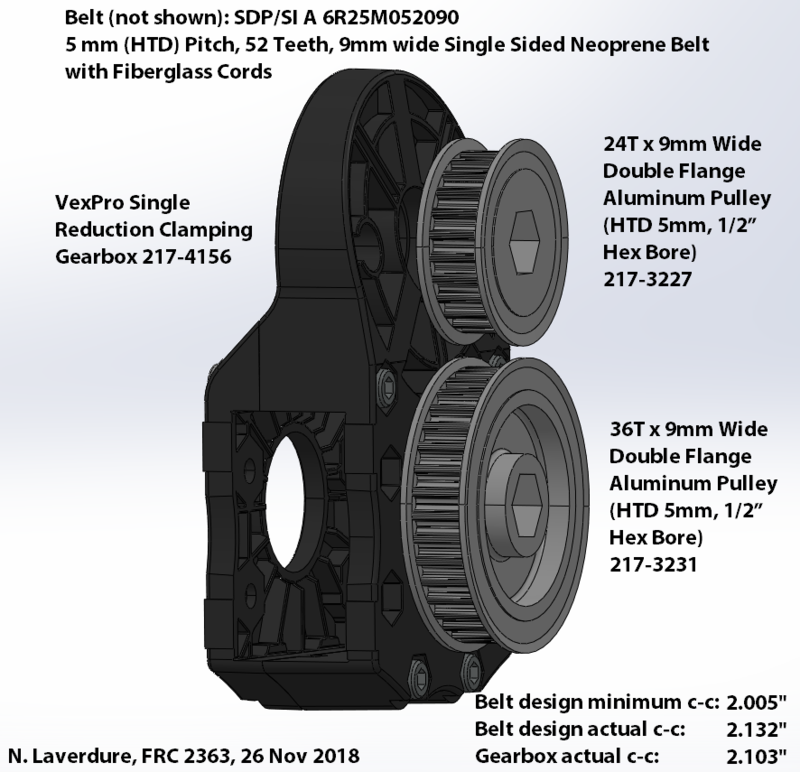 Did you know you can use HTD pulleys instead of gears in the VexProSingle Reduction Clamping Gearbox, or in the 3rd stage of a Ball Shifter? 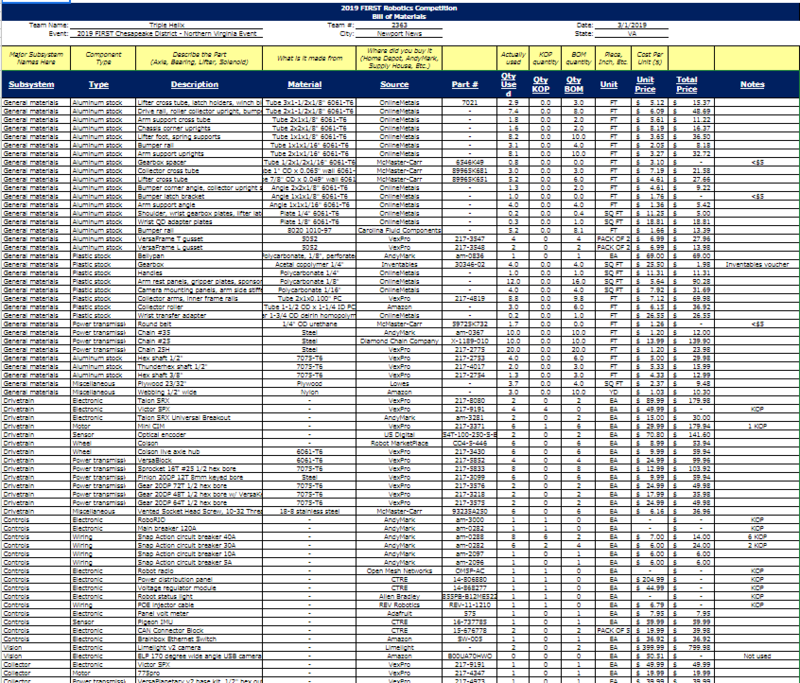 Here’s a spreadsheet of belt/pulley and chain/sprocket combinations that may be swapped into some common COTS 20DP gear spacings: 84, 90, and 112 teeth. Intentional Innovation Foundation announces the founding of the Peninsula STEM Gym, a place for student robotics teams to develop competition robots and have real-world engineering experiences that will inspire a lifelong interest in science and math. Establishment of the Peninsula STEM Gym is made possible in part by a generous Community Knights GIFT Grant. 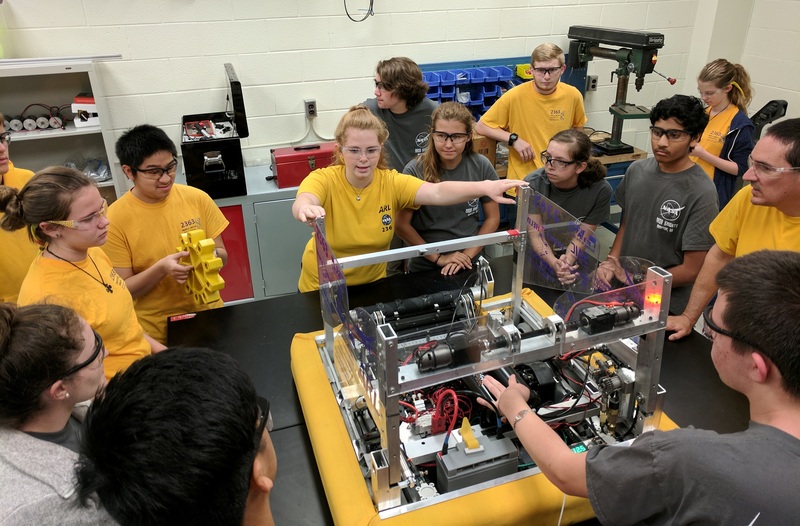 Located in central Newport News, the Peninsula STEM Gym offers local student robotics teams a 2,500 square foot practice area for testing robot functionality against the same field elements as they’ll encounter at real competitions. The facility will enable teams to gain driving practice, discover ways to iterate and improve their robot designs, and become better prepared to compete against other top Virginia teams as well as on the world stage. 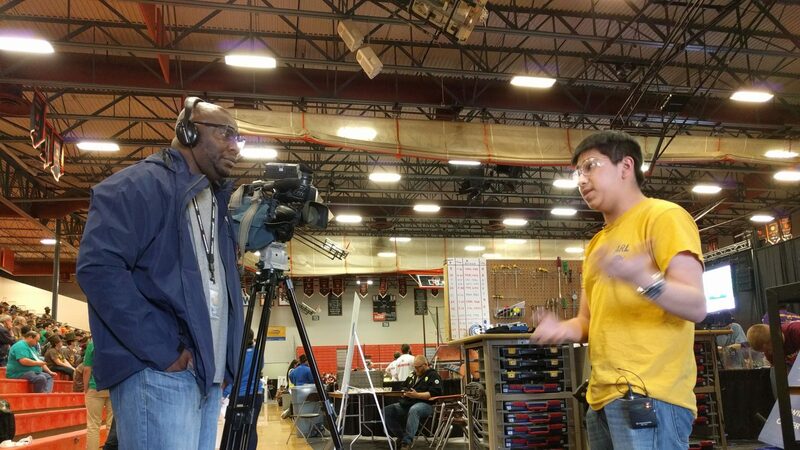 Four Peninsula student robotics teams, with an average of 20 students each, plan to use the STEM Gym to practice for the FIRST Robotics Competition (FRC) in spring 2019. By enabling these students to better practice their sport in a STEM Gym, we increase the likelihood that they can “turn pro” upon graduation, entering career fields which reward the communication and leadership skills that they learn through existing mentor-based robotics competitions. Intentional Innovation Foundation, Inc. transforms students and our community into evangelists for science and technology by providing them life-changing opportunities to experience these subjects as a thrilling, challenging competition. 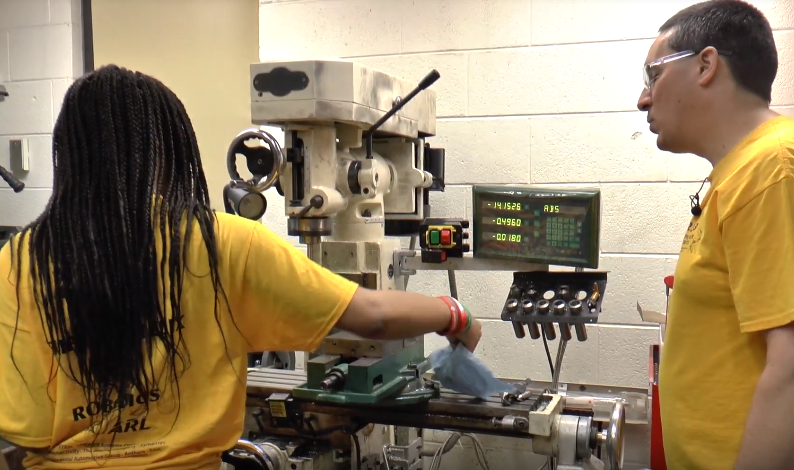 The Newport News nonprofit organization recognizes that developing the future engineering workforce requires a culture shift that makes engineering “cool” again. Community Knights, Inc. is committed to identifying the needs of small local nonprofit and public school organizations as well as the populations they serve and finding innovative ways to help them meet these needs collaboratively. The nonprofit organization is also dedicated to identifying service gaps for underserved populations within our community and, through the development of a nonprofit incubator, support and educate start up organizations to fill unmet needs within the Virginia Peninsula community. The Peninsula STEM Gym is located at 11516 Jefferson Ave Unit #2, Newport News, VA 23601. Those wishing to get involved with the Peninsula STEM Gym are invited to attend the first Open House to be held on Saturday, November 17, 2018 from 2pm to 6pm at the facility. Community members wishing to contribute financially to the Peninsula STEM Gym are invited to sponsor the purchase of a chair. Task chairs will be grouped around workbenches lining one wall of the facility, providing a comfortable working environment for students to explore concepts in group problem-solving and teamwork. Sponsors of chairs will be invited to attach customized brass name plaques to their chairs at the inaugural open house of the STEM Gym on Saturday, November 17, 2018. Triple Helix Tech Tips are an idea we’ve been mulling for a while. This is where we share our tips and tricks, which we hope will be useful especially for rookie teams. We’ve been around a while, and have learned some lessons, sometimes the hard way. Hopefully these will save you a little pain, a little time, and a little cash. 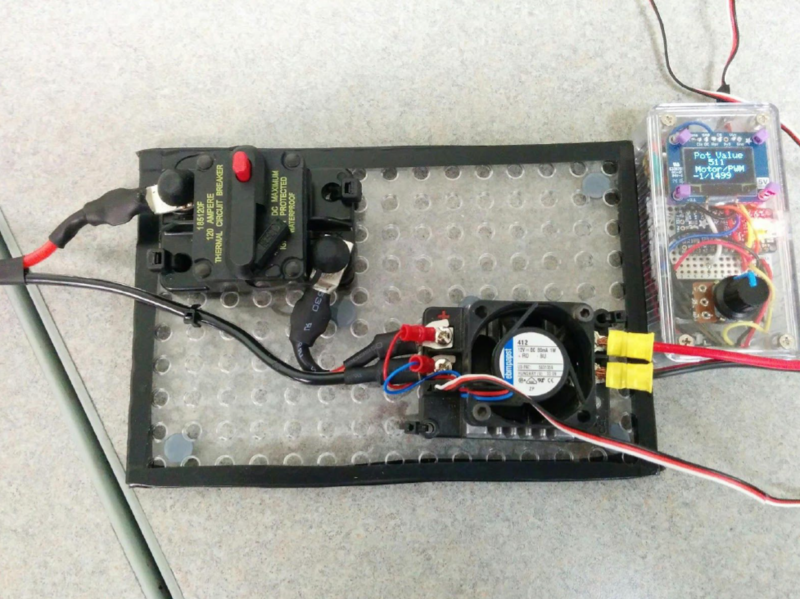 This project uses easy to find and affordable components to construct a Pulse Width Modulation signal generator that can be used to test motors and servos. The ability to bench test motors, subsystems, or prototypes without the need for RoboRIO or special software can save time. It is also a fun and and interesting project for the electrical team! When we recruit new students, one of our favorite lines is, “Nobody who joins the team knows how to build a robot. We’ll teach you.” As an established team, we go to competitions and see younger teams, some of whom don’t have engineering mentors, struggling to learn lessons we have learned the hard way. We see our role in growing FRC as helping those struggling teams become better more quickly, so they remain inspired, and don’t fold. Last fall our students came up with the idea of producing a series of instructional videos. These would teach our incoming rookies the skills they would need to be productive robot builders. 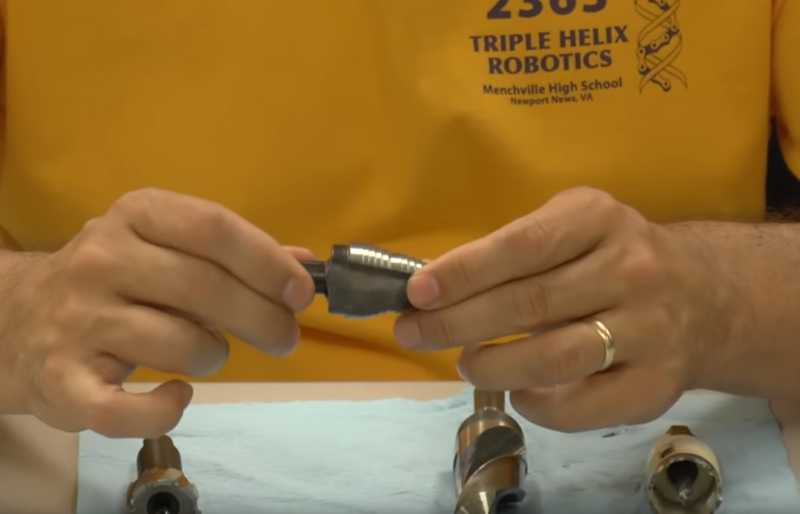 We see this video series, and the ones which will follow, as a tool which can help educate inexperienced students on our own team as well as other teams across FRC. Latest complete CAD model of Genome Kappa, the Triple Helix robot for the 2018 FIRST Robotics Competition game, FIRST POWER UP.